After 50 years and 700 issues, the man behind Spider-Man‘s mask is now no more. Last week, on the day after Christmas, Marvel Comics brought Peter Parker’s story to a tragic end. The 700th issue of The Amazing Spider-Man, which carries a price tag of $7.99, concludes the “Dying Wish” story arc. It also acts as a series finale. Peter’s demise came by way of Doctor Octopus’s latest scheme. 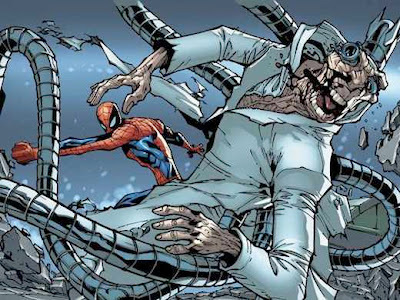 A dying Otto Octavius develops technology that allows him to swap minds with long-time his longtime nemesis, Peter Parker. 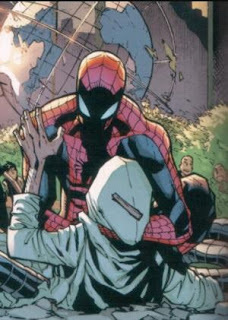 As a result, Octavius now inhabits Parker’s virile young body, while Peter is trapped in the rapidly debilitating physique that once belonged to Octavius. When Peter finally expires, Otto Octavius then takes up the mantle of Spider-Man. Hence, the most relatable alter-ego in comic book history is no more, at least for now, anyway. It’s a sad fate for a character that born in August of 1962, in the pages of Amazing Fantasy #15. By all accounts, he shouldn’t have worked. Co-creator Stan Lee wanted to develop a character that would appeal to the rapidly growing teen market. Marvel’s publisher, Martin Goodman, wasn’t exactly taken with the idea. In his mind, people found Spiders creepy, and teenagers were only ever meant to be sidekicks. Goodman took a chance on Lee’s idea despite such reservations, and the world of superhero comics has been all the better for it. Writer-editor Stan Lee and artist-writer Steve Ditko retooled the concept of the superhero, making such characters mirror reflections of the very audience they catered to. Many fans around the globe have responded violently to the news of Peter’s demise. Some have even gone so far as to send writer Dan Slott death threats. I feel their pain, as I have always considered Peter Parker my superhero surrogate. If I’d been blessed with superhuman abilities during my teenage years, there’s no doubt in my mind that I’d have been just like him. He’s perfectly imperfect. He’s neurotic, guilt-ridden, perpetually anxious, and very unsure of himself. However, he’s also highly intelligent, resilient, and unwaveringly duty bound. When donning the Spider-Man persona, he’s cocky and witty. Peter is the undying spirit of the little guy, crossbred with that of the fandom’s collective superego. For 50 years, the little guys of the world have cheered him on. By doing so, they cheer themselves. Though I’ve always been captivated by Peter’s fighting spirit, I wasn’t introduced to it through the medium of comic books. My first acquaintance with Mr. Parker came by way of the 1967 cartoon that was initially produced by Grantray Lawrence animation, and then handed off to cult favorite Ralph Bakshi. During my early childhood, syndicated reruns of it were shown on WNEW Channel 5 in New York. Aside from the now iconic theme song, I remember the often used shot of Spidey swinging from one webline to other like an urban Tarzan. Your Friendly neighborhood Spider-Man, as envisioned by the 1967 cartoon from Grantray Lawrence animation. Well before I’d ever laid eyes on that cartoon, I’d received some kind of Spider-Man toy vehicle as a Christmas present. I mainly remember it from perusing old family photo albums. I suspect that was where my fascination with the character truly began. At first, it was his amazingly (pun intended) colorful costume that grabbed my attention. I also had an action figure. Noting the absence of web-shooters, I actually created some out of nearly microscopic bits of scotch tape. Even at that tender age, my infatuation with Spidey bordered on the obsessive. Around that same time, I’d sit through entire episodes of The Electric Company just to catch a tiny glimpse of the Spidey Super Stories segments that appeared during the show’s final three seasons. Also during that time, my father recorded the two hour pilot episode of the live action Amazing Spider-Man television series when it aired on WWOR Channel 9 in New York. The series originally aired on CBS in the late 1970’s until its cancellation. The production values were scarcely better than the Electric Company skits, but at 5 years old, I could care less. It was Spider-Man, and in my mind that automatically made it awesome, regardless of its shortcomings. My father and grandmother would buy me Spider-Man comics sporadically throughout my childhood. Again, I was struck by the design of Spidey’s costume, as well as the use of color. Peter may have been something of a sad sack, but his world was as colorful as anything I’d ever encountered up until then. By the late 1980’s, I was old enough to not only read, but understand comics, at least to an extent. 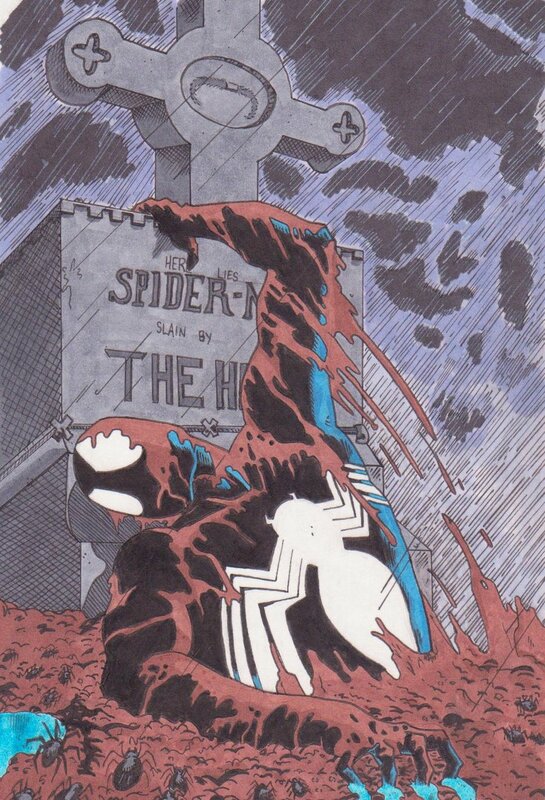 That’s when artist Todd McFarlane began his legendary run. McFarlane was the first artist that I could recognize not only by name, but by his distinctive art style. My father, who had a background in commercial art, referred to it as “jumbled.” Whatever it was, I loved it. By the time Marvel gave McFarlane his very own Spider-Man title, I snapped up two copies. Despite all of the aforementioned, Dan Slott has decided it’s time for the poor Peter to go. More than likely, this decision is temporary. Aside from Peter’s Uncle Ben, characters in superhero comics rarely stay dead. They are usually killed off when sales are in need of a boost. That being said, the question still remains, is Peter’s send off a fitting one? I’d say so, more or less. 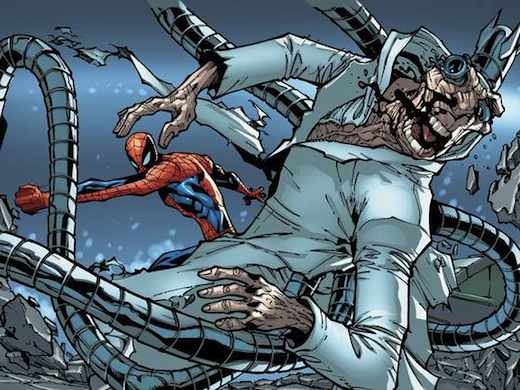 The most intriguing idea featured in the 700th issue of The Amazing Spider-Man is that of Doc Ock taking on the mantle of his greatest enemy. Due to the mind swap, Ock is privy to Parker’s memories and emotions. This infuses Octavius with empathy for his nemesis. He also grows to respect Parker’s determination and persistence in spite of the pain he’s endured over the years. Though such revelations cause Octavius to renounce a life of crime, they also enhance his already acute narcissism. He becomes Spider-Man simply to prove that he can do a better job of it than Parker ever could. Hence the upcoming title Superior Spider-Man, which follows the exploits of Octavius as the world’s favorite Wall-Crawler. Humberto Ramos’s art is suitably cartoonish, if somewhat unspectacular given how momentous the occasion is. Overall, the story plays as an entry in an ongoing serial, which is exactly what it happens to be. One doesn’t need to have read any of the prior issues to understand what’s going on. That makes it accessible to the uninitiated, but it also makes everything seem a tad inconsequential. There’s no real sense of closure, which is probably by design. Still, I’m curious as to where Superior Spider-Man is going to take the story, and that is saying a lot. With all that Peter Parker has gone through over the years, he’s earned a much needed, if temporary rest. That being said, I’m said to see him go. It’s funny how that works. Spider-Man has become a symbol of hope, just as all classic heroes do. Ironically, the only way to keep that hope alive is to make Peter’s suffering perpetual. Alas, love is always tinged with a bit of selfishness. Never the less, I am sad to see Peter go, though I’m sure he’ll be back soon enough. He bore his burden honorably and touchingly. There have been many superhero alter-egos in the world of comics, but few approach the greatness. Rest in peace Peter Benjamin Parker, at least for now. You’ve always had, and will continue to have, my respect. A hint of things to come? I think so.